We are in the midst of haying season. Hay is cut, bales are made, and now it’s time to store them for future use. How hay bales are stored can have an economic impact not only now but also farther down the road. “The method of storage throughout the rest of the summer and into fall and winter is important to maintain forage quality as well as minimize waste and cost of production,” states Taylor Grussing, cow-calf field extension specialist at South Dakota State University (SDSU), in a recent article published on SDSU’s extension website, iGrow. Grussing identifies three factors that have influence in outside forage storage loss: Bale density, field operations, and weather conditions. 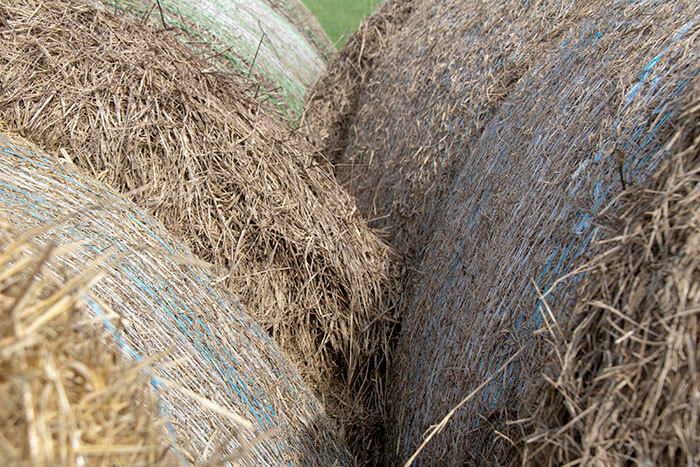 Bale density: A denser bale usually results in a lower amount of spoilage. Grussing advises that round bales be a minimum of 10 pounds of hay per cubic foot. Field operations: Creating even swaths that fit the width recommended for the baler being used will help ensure bales are uniform and reach an ideal density. Weather conditions: Higher amounts of rainfall lead to a greater chance of storage losses if bales are stored outside. The method of stacking and storage used can help reduce some loss. To promote uniform regrowth, remove bales from the harvest area as soon as possible. If bales are stacked along edges of harvest areas, place round bales flat end to flat end in north and south rows; east and west rows will cause north-facing surfaces to deteriorate. Place stacks in well-drained, nonshaded areas to prevent spoilage. Keep at least 3 feet in between rows to allow adequate airflow and sunlight penetration as well as reduce moisture accumulation. If bales will be removed from the field and stacked elsewhere, make sure bales are dry and cool to reduce heating and potential fire danger. Possible options for storing bales include stacking outside with or without cover, outside on protected ground (for example, on pallets or tires), wrapping in plastic, or inside a barn. While exposure and storage loss lessens as storage type intensifies, cost of storage does escalate. “Storage costs may seem expensive at first, but if you put the pencil to the paper, the price of wasted hay isn’t cheap,” Grussing states. She adds that it may be cost effective to improve storage methods depending on how much hay is harvested each year. One advantage of storing hay outside is unlimited space. But, storing hay in a barn maintains better forage quality because of less moisture and reduced spoilage. There are drawbacks; space is limited, and careful stacking is needed to preserve the barn’s structural integrity. “Taking into account current hay prices, last year’s reduced forage production, and future forage needs, storage options may need to be re-evaluated sooner than later,” Grussing says. She acknowledges that building a barn may not be realistic, but encourages producers to look at current storage and stacking methods to see if changes can be made this summer to reduce waste through the rest of the summer and into the fall. Grussing also advises to document current hay inventory, including waste, and compare it to the winter needs of the herd. She adds that if more hay is needed, purchase hay that’s had its quality confirmed by a nutrient analysis. Tracking hay waste year-to-year and comparing the cost of waste hay to the cost of improving hay storage long term is another action that Grussing recommends.